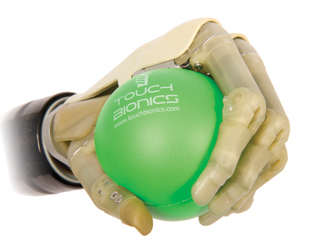 The newest member of Touch Bionics' i-LIMB family, the i-LIMB Pulse, includes a host of enhancements including pulsing grip strength, multiple software-enabled grip patterns and robust aluminum features for improved user confidence. The i-LIMB Pulse is an all-new version of the revolutionary i-LIMB Hand, the world's first commercially available bionic hand. With an aluminum chassis, knuckles and dislocators, the i-LIMB Pulse's robust design features make it Touch Bionics' toughest prosthetic device yet, capable of supporting a load of up to almost 200 pounds. While the same candidates for the original i-LIMB Hand are also candidates for the new i-LIMB Pulse, the aluminum features expand the product line's potential user-base to include a segment of the population that are seeking a device that can accommodate increased activity levels. The i-LIMB Pulse is so called because it utilizes Touch Bionics' patented pulsing technology to provide increasing and controllable grip strength to each individual digit. This increased grip strength is invaluable when a user needs to apply greater force for activities of daily living such as tying shoelaces, griping a light switch cord or doing-up a belt. With a range of automated features that allow various combinations of grip patterns and other digit postures to be activated by the user, the i-LIMB Pulse offers an unparalleled degree of feasibility for its users. Patterns like index point, precision pinch, lateral key grip and three-jaw chuck (tripod) are all now easily activated in a single action by the user. Key to the Pulse is BioSim, Touch Bionics' Bluetooth®-enabled software that allows prosthetists and, for the first time ever, users to select the features and controls strategies that work best for them. Touch Bionics has worked with literally hundreds of clients and the majority of users prefer a smaller, low-profile device, and as a result the i-LIMB Pulse is offered in a lifelike low-profile design as standard. Available in two sizes, the hand is suitable for both male and female users. 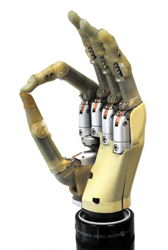 The new generation of multi articulating myoelectric prosthetic hands claims to be more functional than a one joint prosthetic hand. The aim of the study is to establish and compare the functionality of the myoelectric DMC plus, the i-LIMB and the i-LIMB Pulse hand. For the first time in 20 years, Angad Patheja is able to use "fingers" for assistance in daily activities thanks to the technological advancements in upper limb prosthetics from Touch Bionics, designers of the i-LIMB Pulse. Patheja was fitted with the i-LIMB Pulse by his Orthologix prosthetist, John Swoyer, CPO. The i-LIMB Pulse offers the use of five fingers to bend and move, unlike previous myoelectric devices that could only open and close. These grip options support almost all daily activities including holding a fork, picking up a coin, turning a key in a lock, operating computer keyboards and inserting a disc into a CD or DVD player, to name just a few. 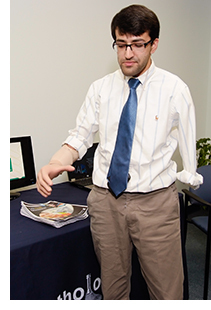 The inclusion of a thumb that can, like the human thumb, be rotated into different positions enables grip configurations, many of which have not been available to amputees before. "Angad was an excellent candidate for this technology because he had been using a myoelectric arm for most of his life," explains Swoyer. "However, the myoelectric only provided a three-jaw chuck pattern, meaning that only the thumb and the second and third finger moved, providing him with a pinch force with limited capabilities. 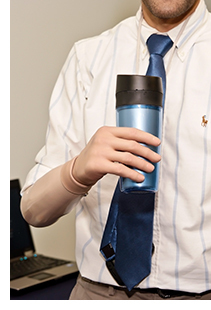 In contrast, the i-LIMB Pulse allows him to use multiple finger patterns such as extending the index finger for typing or using just the thumb and index finger for holding a CD." "With the i-LIMB I can grip things using all five fingers. If I want to use my index finger to type or point, I am able to toggle between functions," Patheja said. "It's very intricate, so there are small things I can do such as holding a piece of paper without crushing it or holding a glass and taking a drink of water or holding a bar on a subway train. It's everyday things that perhaps a person with biological hands doesn't think of, but for me this hand will be very beneficial." Patheja is currently only fitted with the i-LIMB on his right arm. Although he has a conventional prosthesis for his left arm, he wears it only infrequently because he says it is very heavy and it slows him down. He would like another i-LIMB for his left side to assist with things such as holding a paper down while he is writing and also to help keep him more balanced. "Right now, I tend to lean to the right when I'm walking because there is more weight on my right side. It's nothing drastic, but I would like to look more normal." Patheja's limb loss has not limited his educational or recreational pursuits. He was a high school varsity soccer player and he performed with the Bhangra Elite Dance Team at the University of North Carolina, where he graduated with a degree in philosophy and international studies. He has completed some course work for his MBA at Rutgers, but is now focused on obtaining his Juris Doctor degree from Temple's Beasley School of Law. Patheja became an amputee when he was two years old, the victim of a freak accident. He was standing on a balcony at the family residence in Mumbai, India, when the balcony a level above him suddenly collapsed, crushing him. He was rushed to a hospital where his right arm was amputated just below his elbow and his left arm was amputated just below his shoulder. After his recovery, the Patheja's moved to the Philadelphia area and he began receiving treatment at Shriners Hospital, where the family became acquainted with Swoyer. "Angad spent much of his early childhood in hospitals with many surgeries," Swoyer said. "He presents with a right below elbow and a left above elbow amputation. Due to his very short residual limb on the left side he abandoned use of a prosthesis for most of his early childhood and relied on use of a right below elbow prosthesis." Once Patheja turned 21, he was no longer eligible to receive treatment from Shriners so he turned his care over to Swoyer, who evaluated him for the i-LIMB. "Angad has used a myoelectric prosthesis for at least the past 15 years so he was a perfect candidate for the upgrade," Swoyer said. "There was no time spent in teaching Angad how to operate a myoelectric prosthesis because of his past/present experience in operating one since a young child. Angad can hold a key and turn it to unlock a door. He can insert a CD into a computer, type with one finger on a computer keyboard, MAC Machine and/or cell phone. He can hold larger objects (cups/bottles). He can increase his grasp strength. The hand looks and moves like a real hand and its covering also makes it look natural. That helps with any amputee's self-esteem." Although Patheja is well-versed in myoelectric technologies, he still faced a learning curve when using the high-tech i-LIMB. "Before I had basic open and close functions but now there are so many different, but useful, functions on it that it is taking me a little time to get used to it. But it gets better every day," he said. Swoyer concurs: "The learning curve came for the both of us in programming the desired grip patterns that he wanted to use," said Swoyer. "This was and is an ongoing process since Angad has started law school and isn't able to spend much time at the office. I feel it safe to say that Angad figures things out on his own and has worked on changing patterns independently. Once he gets some free time we will get together for a follow-up visit and my education will continue with Angad as the teacher. "Angad is an amazing individual who has overcome so many obstacles that able-bodied people take for granted," Swoyer said. "It has been a privilege working with him and our next adventure, once time permits, is to provide a left above elbow prosthesis." "For any myoelectric prosthesis, the patient has to have adequate electrical signals from movement of their muscles," said Swoyer. "A new candidate would be tested for strength of their electrical signals given off from movement of their muscles. In addition, standard guidelines apply meaning that a patient's residual limb must be viable to accept fitting of a prosthetic socket. This would include adequate length of residual limb as well as overall skin condition (well healed/well shaped/skin grafts)." Experienced medical and rehabilitation team management. Making certain that the prosthetist and therapist are knowledgeable and trained in upper limb fittings. Prescribing a prosthesis to those who are appropriate candidates. Unless an upper limb patient has been appropriately screened for candidacy, the outcome will be compromised. Skilled fabrication of the prosthesis. This is critically important. A poorly fitting or badly made prosthesis will limit the patient's ability to succeed with it. Skilled occupational therapy training of the patient in the use of the prosthesis. A patient's success with an upper limb prosthesis will be greatly increased if they are properly trained in how to use it to achieve the tasks they undertake on a daily basis. Comprehensive follow-up with consistent data gathering and documentation of functional needs. Analyzing a patient's experience with an upper limb prosthesis is the only way to truly learn what benefits it brings them. Physical Therapists were among the health care provider groups whose representatives testified before the House Ways and Means Health Subcommittee Sept. 21, hoping to extend Medicare reimbursement provisions set to expire successively beginning Oct. 1 and continuing through July 2012. There are nine reimbursement policies said to address the particular needs of patients and providers that would be affected if the policies fail to renew, which include skilled nursing facilities, and hospitals among others. Of concern to the rehabilitation community is risk Congress will cut off the exceptions process to the therapy cap beginning Dec. 31. Without the exceptions policy, many patients as Medicare beneficiaries are limited to $1,870 in therapy services per beneficiary per year, including physical therapy, occupational therapy and speech therapy. Congress is reported to have extended the cap five times so far. Representatives explained to the Subcommittee failure to extend the policies would inhibit the ability of providers to service patients. Justin Moore, PT, DPT, vice president for government and payment advocacy of the American Physical Therapy Association, reportedly testified the therapy cap would be exceeded by 640,000 Medicare beneficiaries by Dec. 31 should the exceptions process fail to renew. Moore urged the legislators to phase out the process of granting yearly extensions and more toward a reformed payment system based on per visit claims by 2015. Please feel free to submit your questions on the i-LIMB as well as any other issue you would like addressed.